Dr. William P. Foster, "The Law"
Dr. William P. Foster: Over 50 years ago, a young man entered the campus of Florida A&M, determined to make himself and the band program the best in the nation. Armed with less than 30 musicians, Dr. Foster had his sights set on putting 100 marching young men on the gridiron, so he nicknamed the band the "Marching 100." After growing to a little over 100 in 1950, the band started expanding its performance repertoire, adding a fast march (known as "fast one," to be later renamed the "Rattler"), the death march (known as "Slow One"), and a dance routine to the tune of Alexander's Rag Time Band. Fast-forward to the 60's, where he took the "100" to the Superbowl, and the airwaves, being featured on PBS, and later being televised on all of the major networks in the United States! When I first joined the Florida A&M Marching Band (I was a member of the band, NOT the "100"), I would only see Dr. Foster a few times a week. Coming in during the latter part of the week, Dr. Foster would work his magic on our show music, taking the tunes one note at a time, until it was performance-ready. As a freshman, his mere presence put me in awe, although it would be a year before I could really see and understand what was going on. Being a freshman, I only did as instructed, and asked few questions, if any. If everyone else was happy, so was I. While I was a member of the "100," Doc took me and the rest of the band places that we wouldn't normally go. Trips to Miami, Tampa, and Jacksonville were commonplace, but before I knew it, we were in Philly eating their world famous cheese steaks, Indianapolis playing in one of two Circle City Classics, Atlanta, Nashville, Los Angeles, The Bahamas, The Virgin Islands, Washington, DC, and our trip to Paris, France for the French Bicentennial Bastille Day Parade in 1989. He expected nothing less than our best, and made sure that we stayed in the best hotels, had top notch transportation (Go Greyhound! ), and had the nourishment necessary to give a performance that our fans would love, and our naysayers fear. He built what is known as the best marching band in the land, validated by the selection of the John Phillip Sousa Foundation as the 4th recipient of the Sudler Award in 1985, one that no other HBCU has received to date. Dr. Foster retired in 1998, but he has not been forgotten, especially by those who have had the honor and privilege of being one of his pupils. It matters not whether you were a music major, drum major, or business major, he was a teacher, first and foremost, and we've never forgotten it. Dr. Foster is the epitome of coolness under pressure, and his personality and leadership are a part of those who performed under him. 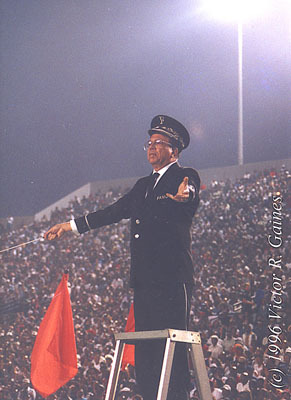 Before leaving the old band room prior to our home games, Dr. Foster would stand on the podium, facing all of his troops and say, "I think the "100" is ready." If he could think it, then it was duly noted, and we performed like a band under his leadership was supposed to. Thanks, Doc, for the kind and encouraging words, the great trips, the "transfer of learning," and for reminding me that no matter where I go, I can see a part of Dr. Foster in every one who has ever put on a band uniform for the Florida A&M University "Marching 100" Band! Marching 100 Alumni Band Association, Inc.